Among the many strategies for losing weight and aging well – following a low-carb diet, eliminating gluten, getting more exercise – there’s one that’s consistently recommended by researchers: calorie restriction. When you take in fewer calories than you require to maintain your current body weight, you’ll lose weight. The big challenge is how to sustain the calorie deficit long enough to see significant results. A relatively new strategy called “intermittent fasting” may offer a manageable way of eating less because you’re only required to diet some of the time. Fans say it’s a plan that you can stick with over months, even years. Intermittent fasting means severely restricting your food intake on one, two or more days of the week and eating normally the rest of the time. The so-called “fast days” aren’t total fasts; rather, you take in about a quarter of your normal calories. For women, that represents about 500 calories, for men, about 600 calories. It’s often referred to as a 5:2 diet, with five normal days and two fasting days; other versions are called 4:3, 6:1, alternate-day fasting (ADF), or the “every-other-day” diet plan. A 2012 BBC documentary, Eat, Fast and Live Longer, is often credited with bringing intermittent fasting into the mainstream, but it’s been researched longer than that for its potential benefit in reducing breast cancer, heart disease, diabetes and cognitive decline. In fact, calorie restriction for longevity has been researched since the 1930s and is so far the only method proven to improve longevity, at least in lab animals. Several studies have suggested that intermittent fasting works as well as continuous calorie restriction for weight loss, but there’s still little evidence on the long-term effectiveness of the diet. Researchers note that effective diets are satiating, provide for your nutritional needs and be easy to follow. Since intermittent fasting doesn’t require a total overhaul of your diet, simply a restriction of calories on some days of the week, it may be successful dieting method. Long-term studies are needed, however, to show the safety and success of intermittent fasting. Read an interview with intermittent fasting researcher Dr. Krista Varady. Does It Lead to Bingeing on Other Days? Perhaps surprisingly, this doesn’t seem to be the case. In one study, subjects who ate 20-30% of their normal calorie requirements on fasting days generally ate just 10% more than usual on their non-dieting days. In addition, many people reported that their feelings of hunger on low-calorie days dramatically diminished over time. Another promising finding is that intermittent fasting appears to yield the loss of less lean muscle when compared to conventional daily dieting. In a 2011 review, 90% of the weight lost through intermittent fasting was fat, compared with only 75% in daily dieting. Maintaining lean muscle mass while dieting offers a metabolic advantage for maintaining the weight loss because muscle burns more energy than fat even at rest. Does It Reduce Belly Fat? 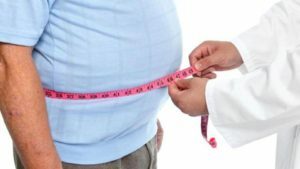 Belly fat, aka visceral fat, is the spare tire that surrounds your internal organs, leading to a greater risk of diabetes and heart disease. A 2011 review found that both traditional dieting and intermittent fasting reduce similar amounts of belly fat. The NIH also recommends that adults with diabetes or heart disease should consult their healthcare provider before trying any new diet. Collier, R. Intermittent Fasting: The Science of Going Without. CMAJ. June 11, 2013. 185(9): E363 – E364. Seimon, RV. et al. Short- and long-term effects of continuous versus intermittent restrictive diet approaches on body composition and the metabolic profile in overweight and obese postmenopausal women: a pilot study. Menopause. 2012 Aug;19(8):870-6. Does the 5:2 Intermittent Fasting Diet Work? UK National Health Service (NHS) Public Information Sheet. Accessed January 2, 2014. Klempel MC, Kroeger CM, Bhutani S, Trepanowski JF, Varady KA. “Intermittent fasting combined with calorie restriction is effective for weight loss and cardio-protection in obese women.” Nutr J. 2012 Nov 21;11:98. Krista A Varady, Surabhi Bhutani, Monica C Klempel, Cynthia M Kroeger, John F Trepanowski, Jacob M Haus, Kristin K Hoddy and Yolian Calvo. “Alternate Day Fasting for Weight Loss in Normal Weight and Overweight Subjects: A Randomized Controlled Trial.” Nutrition Journal 2013, 12:146. K A Varady. “Intermittent Versus Daily Calorie Restriction: Which Diet Regimen is More Effective for Weight Loss? Obesity Reviews Volume 12, Issue 7, pages e593–e601, July 2011. Michelle N. Harvie, Mary Pegington, Mark P. Mattson et al. “The effects of intermittent or continuous energy restriction on weight loss and metabolic disease risk markers: a randomized trial in young overweight women.” Int J Obes (Lond). 2011 May; 35(5): 714–727. « Why It Takes Longer For Women To Lose Weight Than Men And What To Do To Speed It Up!